I recently watched an inspiring conversation between cinematographer Louie Schwartzberg and Marie Forleo. Check out their conversation here. 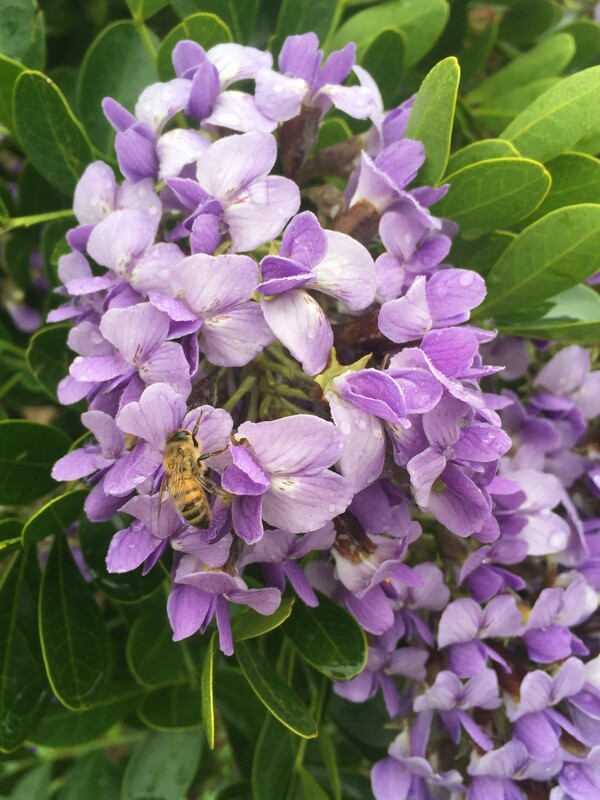 Louie has captured nature’s beauty and awesome-ness in time lapse photography, including Wings of Life about the relationships of pollinators and flowers and narrated by Meryl Streep. Here are a few of my favorite quotes from Louie. You can check out his work here and his TED talk on nature, beauty, and gratitude here. [On filming hummingbirds with time lapse photography]…We live in this narrow world. We’re recording at 24 frames per second. That’s the human POV (point of view). What a wonderful way to expand your mind and your consciousness, to realize there are so many different ways to looking at life, what is real. In slow motion with the hummingbirds, it put you into their world of seeing the combat, the twirls, and all those acrobatics. To our eyes, it’s just a blur. You see a hummingbird go by like that. (Quickly,) there it went. To be in their world, to see it from their point of view, it opens your heart. It makes you appreciate life. It makes you appreciate hummingbirds. It may make you put up a feeder in your backyard. That’s good because I think it generates compassion by being present and mindful and gratitude. Nature’s beauty is a gift that cultivates appreciation and gratitude. Beauty and seduction are nature’s tools for survival, because we protect what we fall in love with. It opens are hearts and makes us realize we are a part of nature and not separate from it. When people see my images a lot of times they will say ‘Oh my God.’ Have you ever wondered what that meant? The ‘oh’ means it caught your attention, it makes you present, it makes you mindful. The ‘my’ means it connects with something deep inside your soul, it creates a gateway for your inner voice to rise up and be heard. And God, ‘God’ is that personal journey we all want to be on, to be inspired, to feel like we are connected to a universe that celebrates life. We’re giants, and we’re unaware of things that are too small for us to see. When a dragonfly flutters by, you may not realize, but it’s the greatest flier in nature. It can hover, fly backwards, even upside down. The sound of a million butterflies flapping their wings is indescribable. It’s very heavenly. Additionally, when the first freeze threatens later in the year, it’s a great time to harvest flowers from the fall garden and hang them to dry. For clients with sensitivity to the cold elements, use these dried flowers in a myriad of indoor crafts during winter and other times of inclement weather. Now I think that you can cut virtually most plants to keep in a vase for at least a few hours. But I do have a few favorites that top my list. Here are a few plants that I grow in the garden and use as cutflowers, fresh and dried. Don’t forget to research the toxicity of these plants before incorporating them into your therapeutic garden. I often say that sunflowers (Helianthus annuus) are the second most recognized flowers with my clients. Which is the most recognized? Roses, of course! Sunflowers are easy to start from seed, either in small pots or direct sow outdoors in the garden. 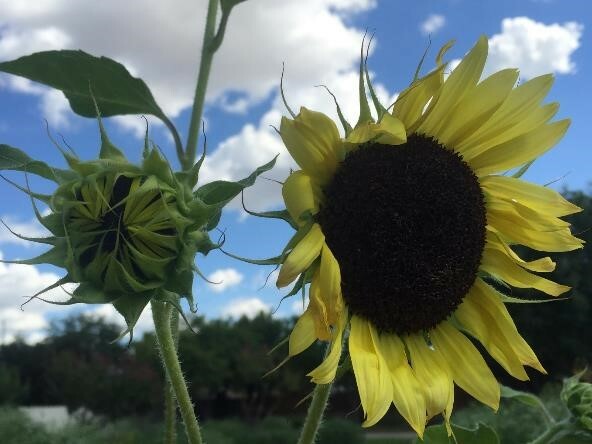 For HT/TH practitioners, “go vertical” with the topic of sunflowers – talk about how they inspired Monet’s garden at Giverny and his artwork or watch time lapse video on how young seedlings track the sun’s angle in the sky, and more. 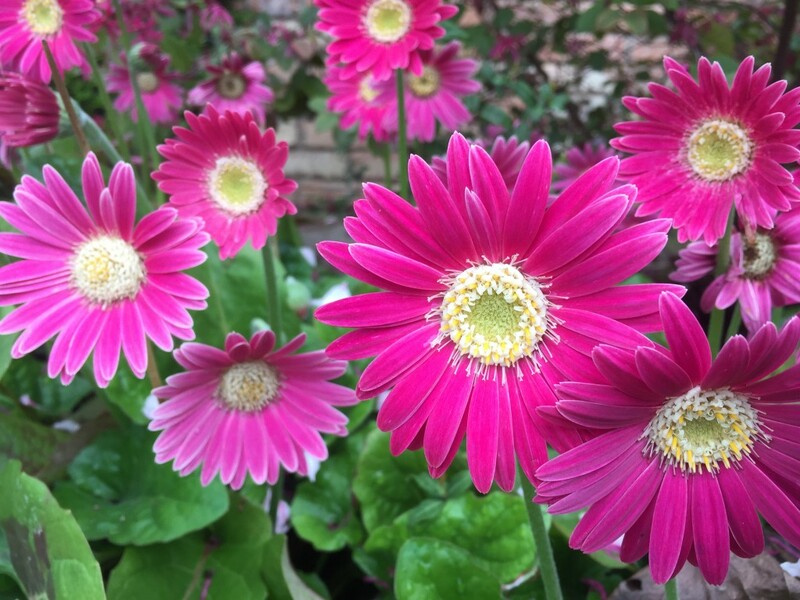 So there are the beautiful annual cutflower types being sold at the garden centers right now (at least where I live), and then there are the slightly less showy, but still beautiful, perennial gerbera daisies that are generally hardy to USDA hardiness zones (7)8. 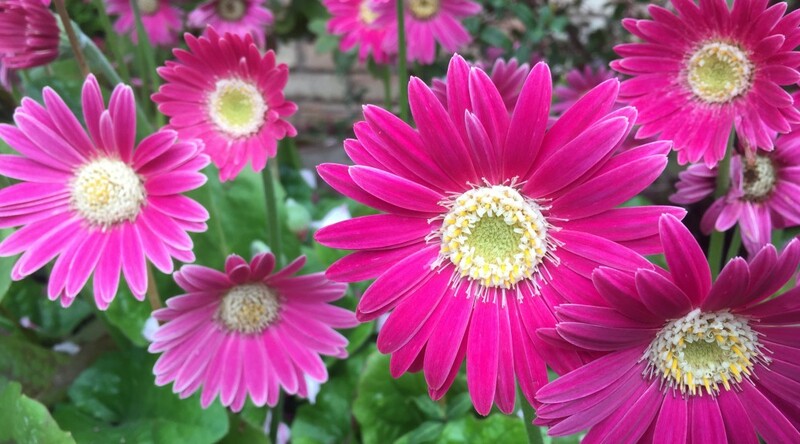 Look for the ‘Patio’, ‘Garvinea’, ‘Drakensberg’, or ‘Garden Gerbera’ series. Note: these are a bit pricy in the garden centers. Invest in at least three plants, and if they’re hardy to your growing area, you won’t be disappointed. Their foliage is evergreen. Mine have been blooming their heads off since late February (probably earlier than that, actually! 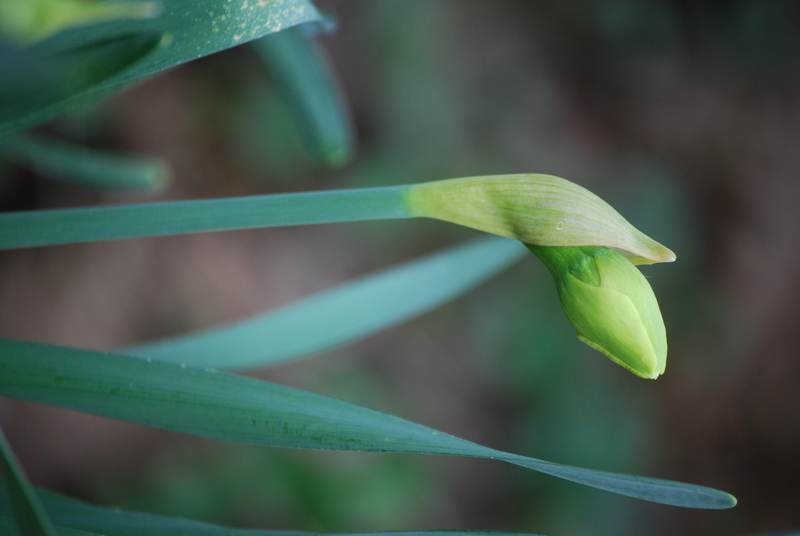 ), and they’re still blooming in late March, with more buds setting. 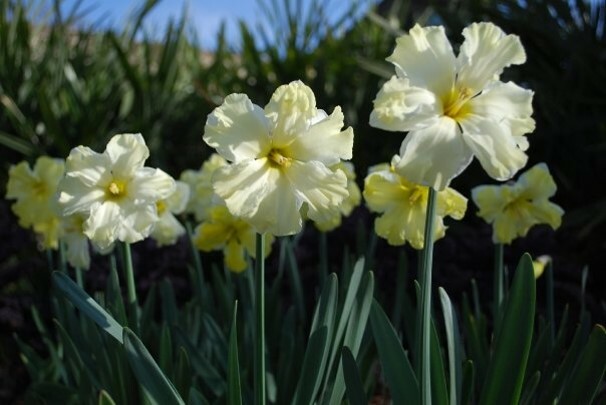 Plant a variety of daffodil bulbs (Narcissus), with other bulbs like tulips and hyacinths, in the fall. 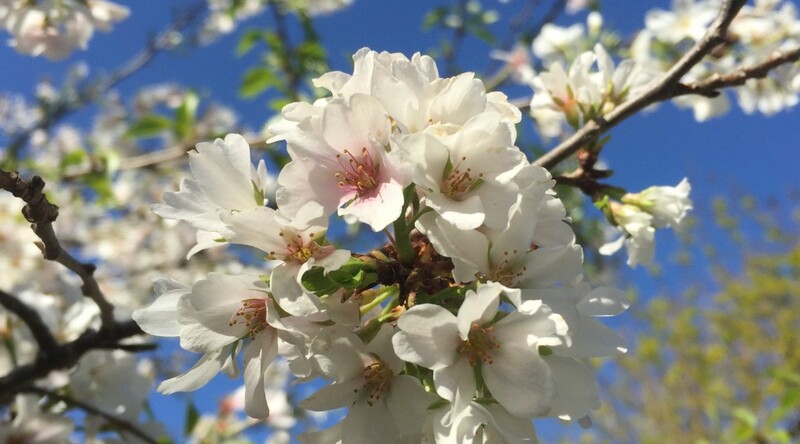 Then harvest a few blooms out of the garden in the spring and mix with spring flowering tree branches like cherry or peach trees in your seasonal arrangements. An easy perennial to grow in the garden, then divide and make more…and more…and more…well, you get the idea. Cut the flowers or even the sword shaped leaves and put into bud vases. 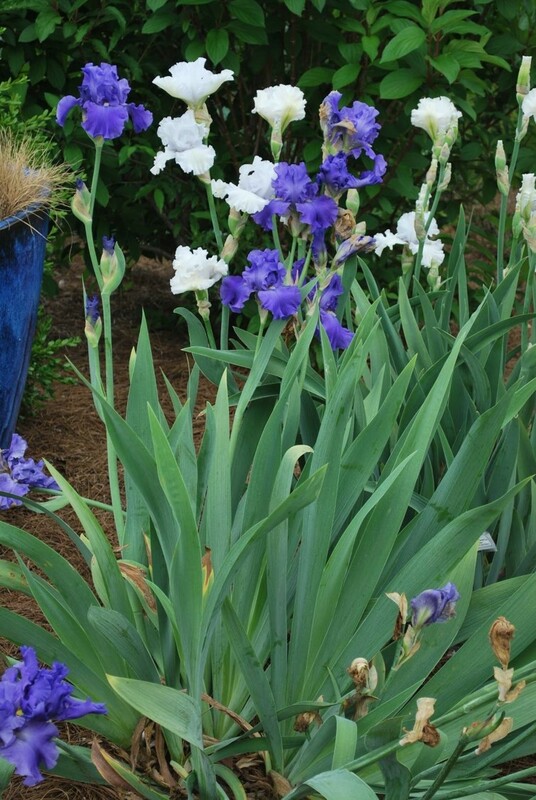 This is a great flower to “go vertical” with and share the Greek myths about Iris. This drought tolerant perennial is loved by pollinators…and in a floral arrangement. 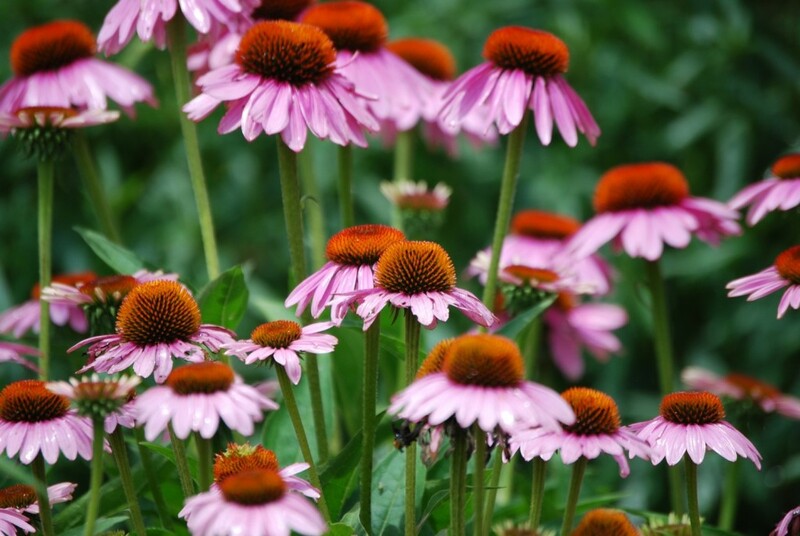 There are so many different varieties of coneflower (Echinacea) with interesting names like ‘All That Jazz’, ‘Coconut Lime’, and ‘Fragrant Angel’, flower colors and shapes, and growth habits. 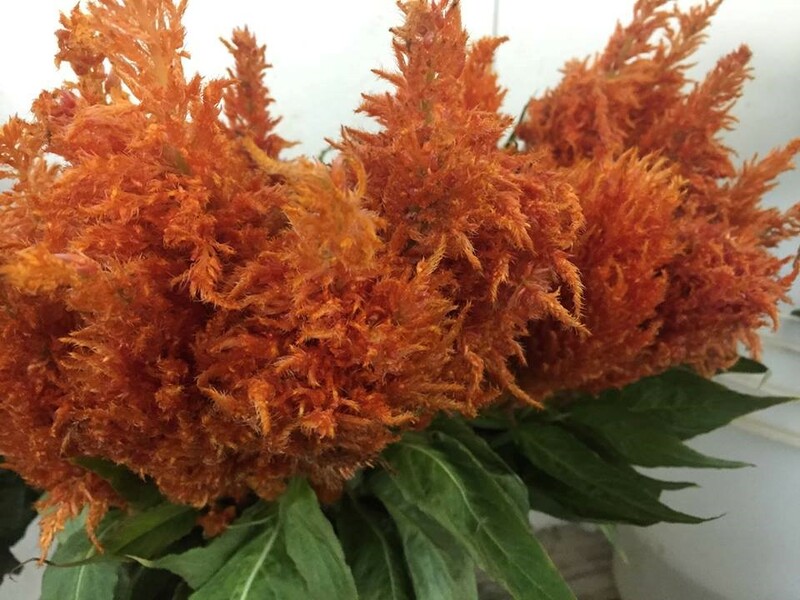 An old fashioned summer annual, cockscomb (Celosia) can used as a fresh or dried cutflower. Often confused as bachelor’s buttons (which is a completely different plant), globe amaranth (Gomphrena) is a great drought tolerant summer annual that can be used as a fresh or dried cutflower. I especially love ‘Strawberry Fields’ (red) and ‘All About Purple’ (purple). 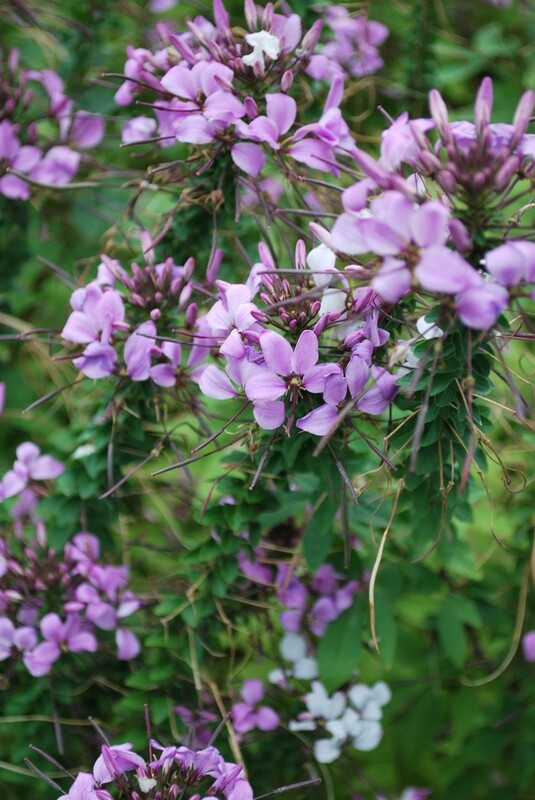 Spider flower (Cleome) is an interesting annual with a towering height. Plug it into the middle to back of a flower border. For some, it grows all summer long. For me in Texas, it fades away in the true heat of the summer. I like the lavender flowers and heat tolerance of ‘Senorita Rosalita’. Don’t forget your greenery. Cast iron plant (Aspidistra) is a stalwart in Southern shade gardens or an excellent low maintenance, low light houseplant. 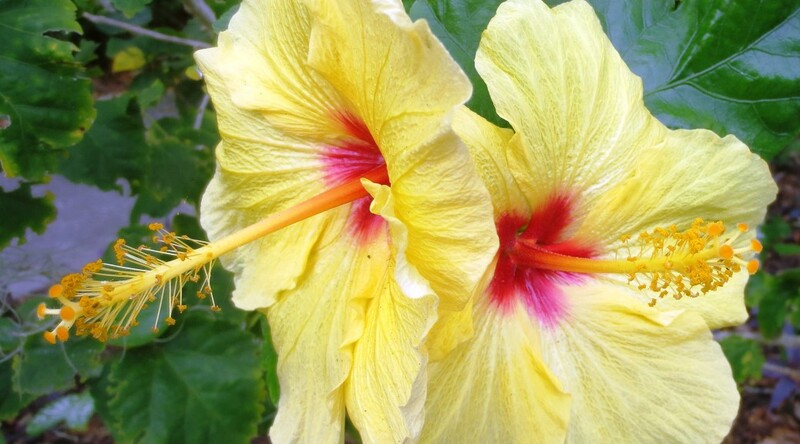 Its strappy leaves are an excellent foil for more delicate flowers or mix with tropical flowers. 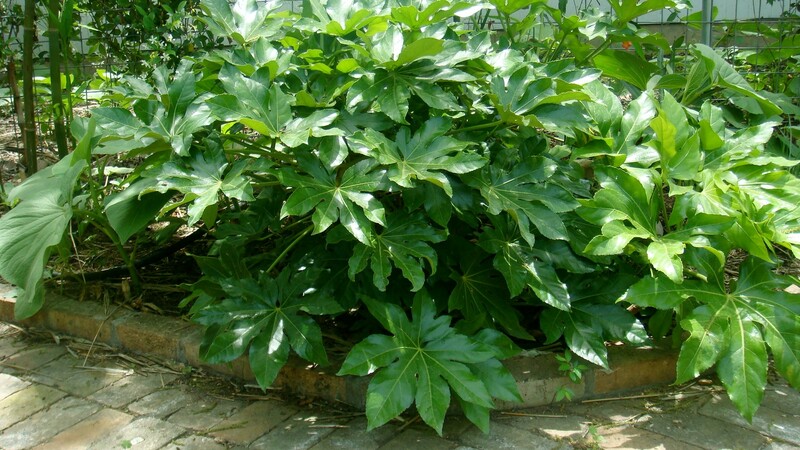 Another option for greenery, fatsia is an evergreen shrub in Southern shade gardens. Its large waxy leaves are also paired well with tropical flowers or as a single leaf with a single flower in a bud vase. 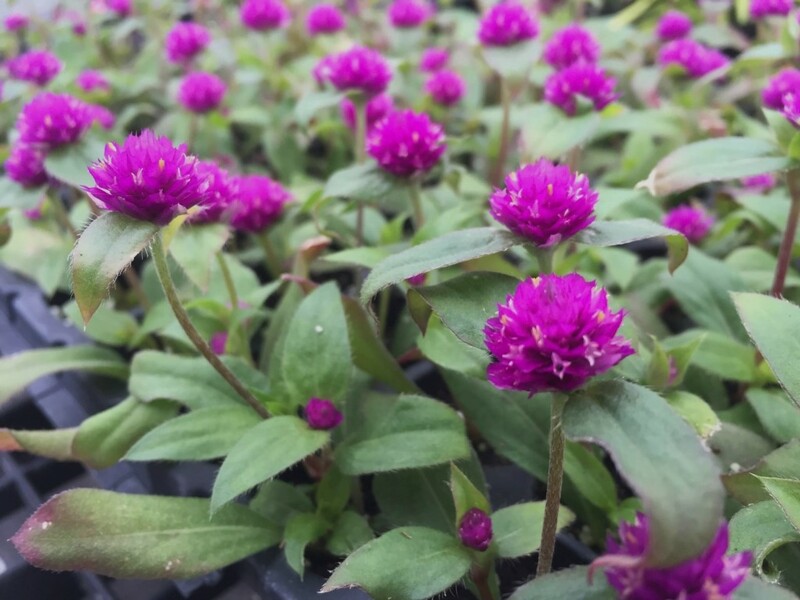 Here are a few additional plants that make great fresh or dried cutflowers or greenery. Whenever I purchase cutflowers, I try to buy flowers, such as baby’s breath, statice, or Billy balls, which I don’t grow but know that they make excellent dried flowers if I have leftovers. To dry flowers, I cut the stems, tie together, and hang upside down in an out-of-the-way spot on a clothes line or herb drying rack. 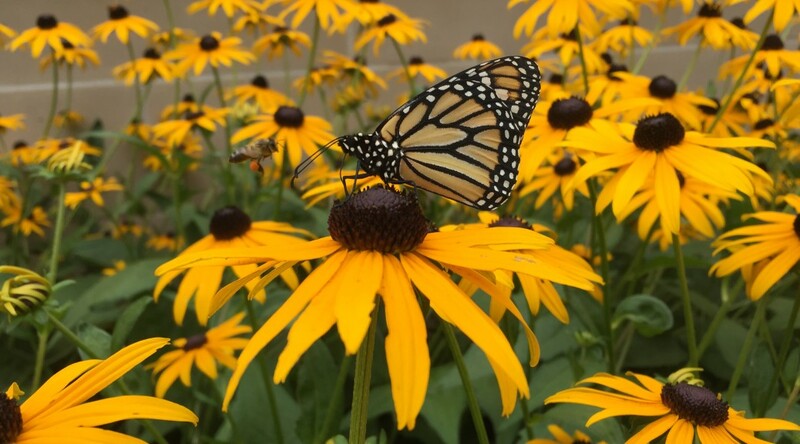 Editor’s note from Susan: My sincere thanks to the Michigan Horticultural Therapy Association for giving us the opportunity to share this piece on guided imagery by Lesley Fleming, HTR. The script was originally written and published during the winter, but it can be adapted for a variety of groups and at any time of the year, especially at times when access to the outdoors is limited or in reminiscing or imagining about a visit to a tropical garden. One of the techniques used by horticultural therapists for a range of populations is guided imagery. The term guided imagery refers to a wide variety of mind/body techniques, including visualization and direct suggestion using imagery, metaphor, and storytelling. Permission is granted to use the guided imagery script below. Consider having live plants or photos of the plants [to accompany the activity]. 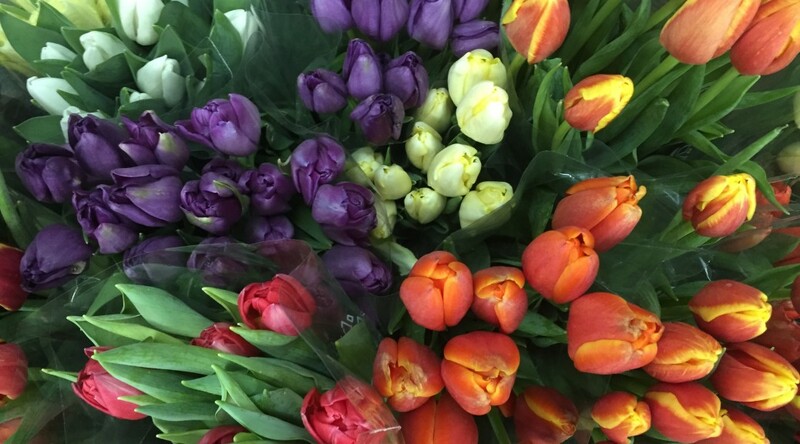 So as the cold days continue and shorter daylight hours affect your mood, think of beautiful flowers in every color of the rainbow. Close your eyes and picture yourself walking along a garden path. The birds are singing, and the breeze is deliciously warm. The flowers sway with the wind and bring a smile to your face. A lovely fragrance fills the air, not too sweet but enough to make you take notice. 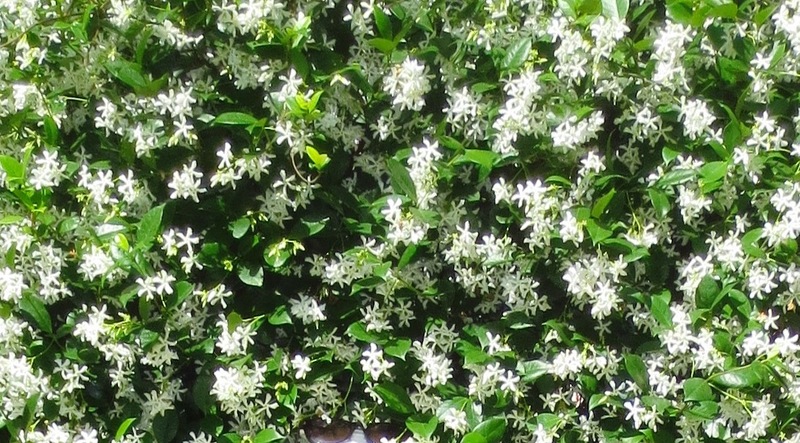 Opening your eyes to petite white star-shaped blossoms of Confederate jasmine (Trachelospermum jasminoides), the green leafed vine is wrapped up and over the arbor, climbing without tendrils. The mix of white and green is soothing, romantic, and fragrant. Am I remembering this from a wedding or a picture of a wedding? Moving deeper into the garden, a swath of color awaits. Hibiscus (Hibiscus rosa-sinensis cultivars) seems to be everywhere, in this garden and elsewhere. Those unfolding blooms that last but one day offer tropical shades of fuchsia, yellow, orange, and red. 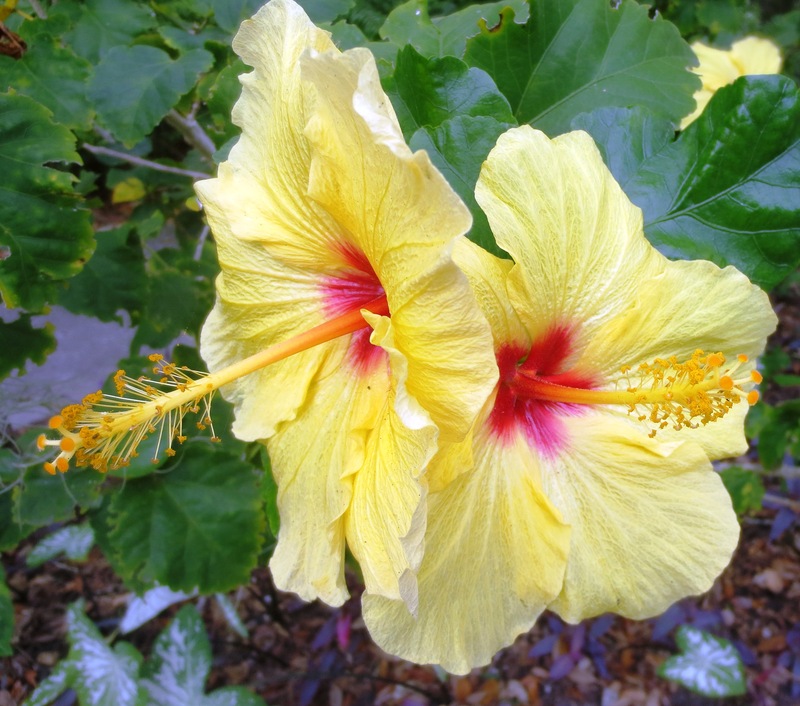 The shrub with more than 4,000 varieties seems to relish the warm weather, inviting ladies to wear a blossom in their hair or tempting one to make hibiscus tea for a hot sunny day. 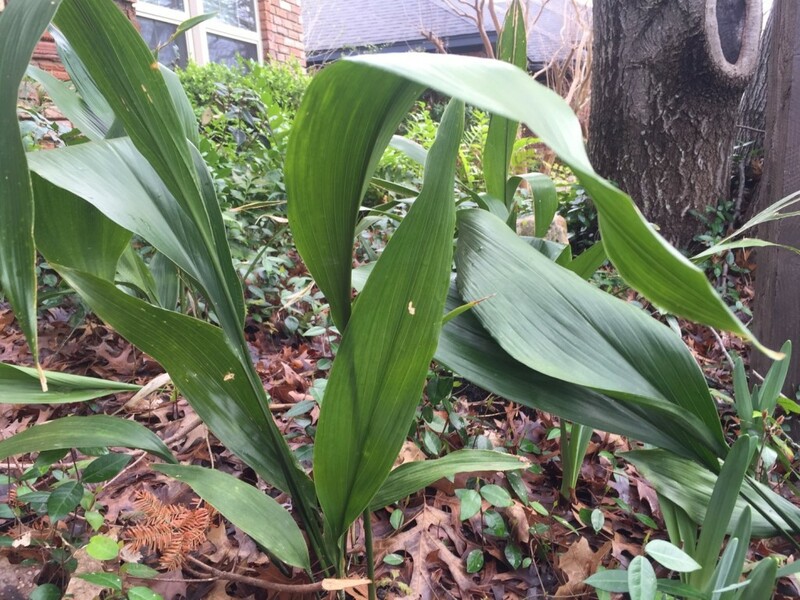 A taller plant with interesting shaped greenery is but a few steps away now. The orange, yellow, and blue on the blossom appears to be a bird in flight. 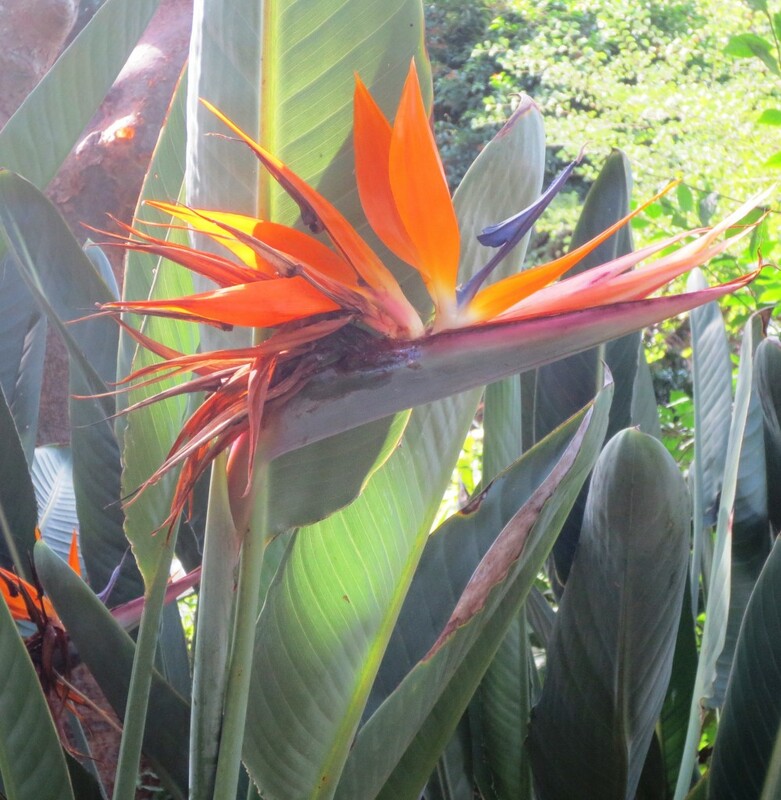 Is it Bird of Paradise (Strelitzia reginae)? They say the colors emerge from the distinctive green pod and sturdy rigid stem over several days. Is it true that this plant is part of the banana family and some varieties can grow as tall as 20 ft.? (correct) I would like to see this with my own eyes. What is that orange-yellow flower that looks like a top hat? The blossom is growing from the branch, with no stem. It has a long tube in the center which remains upright, and the petals have released and dropped down to become the brim. I am not as familiar with Chinese Hat plant (Holmskioldia sanguinea), sometimes more commonly refer to as Cup and Saucer or Mandarin Cup. Have you ever seen a shrub that has several shades of colorful blossoms all at one time? There is a plant sign that reads Kiss-Me-Quick (before I fade), with the botanical name of Brunsfelsia spp. Some know it as Yesterday, Today, and Tomorrow. In the space of a few days, the first opening of the blossom is a lavender color that fades to a lighter purple and eventually to white. Right now the shrub has all of the colors at once. Nature is wonderful. 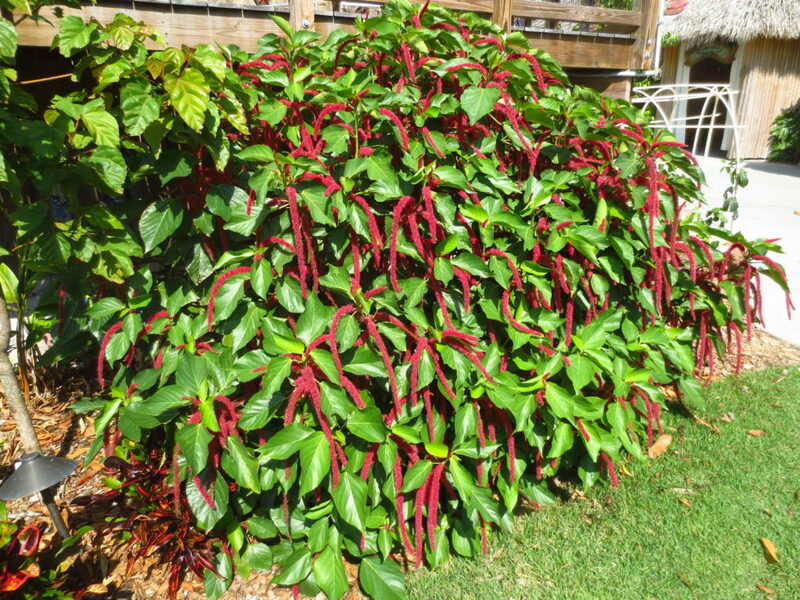 Gazing the length of the garden is a mass planting of about 20 red, 24-inch-tall weeping green stems. A child calls out Firecracker Plant (Russelia equisetiformis). Looking at one plant more closely, the tiny tubular blooms are attached to the stem. There are few leaves, and the red color is fire engine red. This garden is full of color and scent. Reach out…can you touch that plant? It looks like a pipecleaner, those soft pliable craft items. The long, soft, red bloom is actually a spike covered in hundreds of (male) flowers. It is the red stamens of these—not petals that are the velvety delight in my hands. Nowhere to be seen are the female flowers of this Chenille plant (Acalypha hispida), but the green leaves make a lovely counterpoint to the red softness. MacCubbin, T. & Tasker, G. (2002). Florida Gardener’s Guide. Nashville, Tenn.: Cool Springs Press. 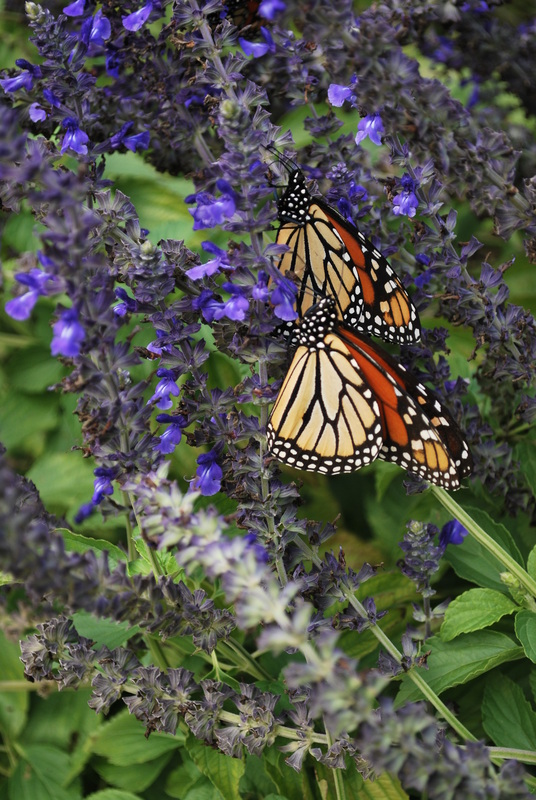 In therapeutic horticulture programs, teach clients about pollinators and other wildlife. In learning their stories, these can become great lessons on shifting focus from the self to the broader world and recognizing that we are all citizens of the world, even bees, hummingbirds, and bats. 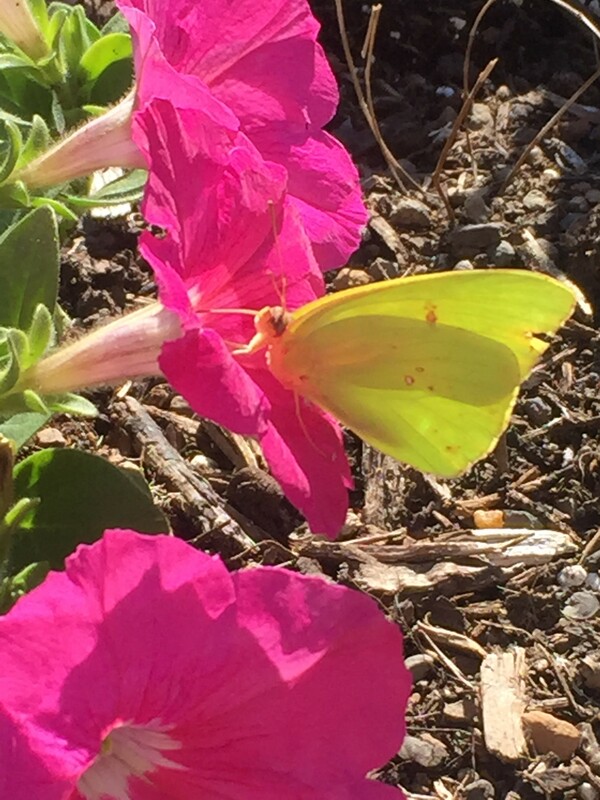 A client might also be able to compare his or her own experiences in dealing with personal challenges when learning about the plight of certain pollinators, who themselves face various challenges like threatened habitats. 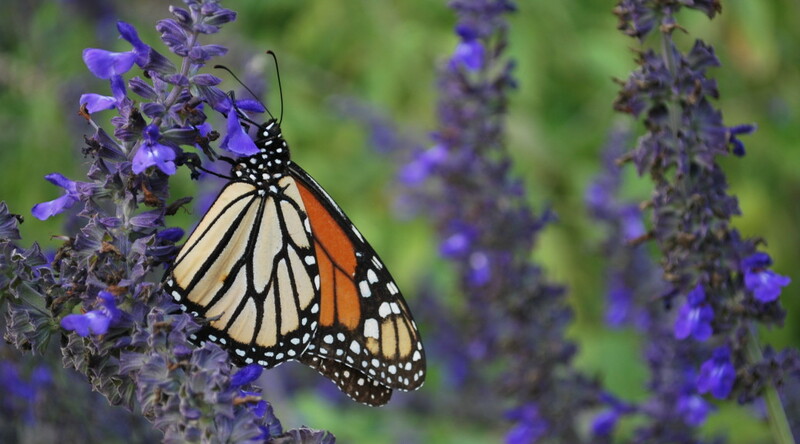 The story of the trek that the monarchs make during their migration can be a metaphor for the hero’s journey – overcoming the odds and experiencing transformation through struggle. 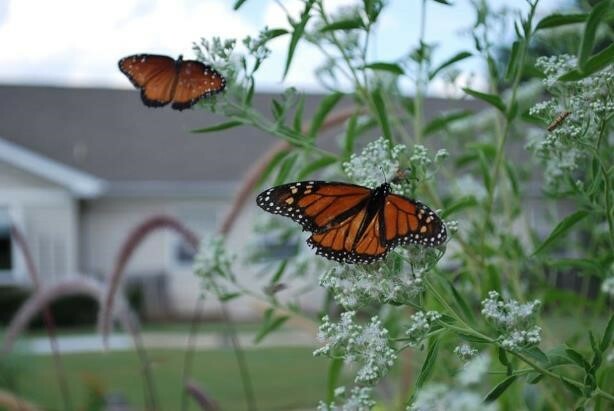 One way to introduce this concept is to join the Million Pollinator Garden Challenge and cultivate a wildlife friendly garden as part of your program…then get your garden certified as a wildlife habitat through the National Wildlife Federation. A wildlife friendly garden incorporates food and water sources for various types of wildlife, options for shelter and places to raise their young, and sustainable gardening practices. 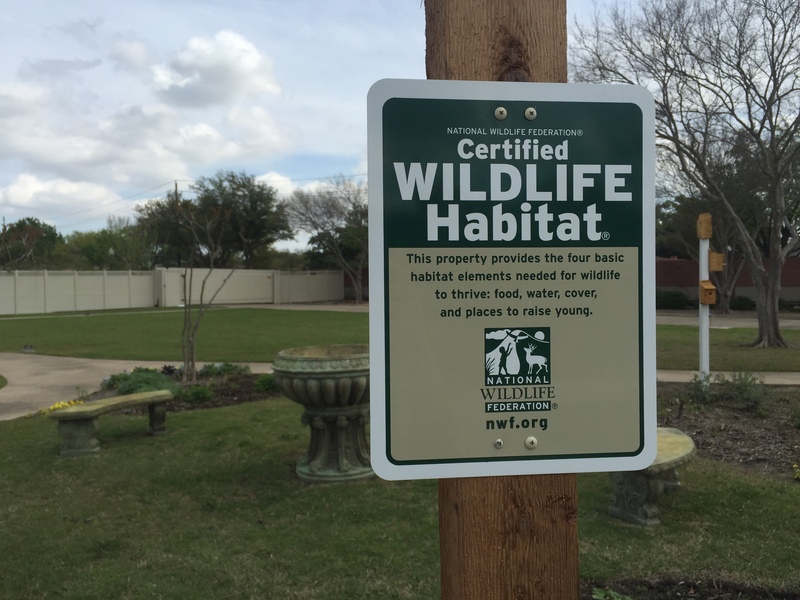 In order to meet the requirements of NWF’s wildlife habitat program, refer to their website for more details. 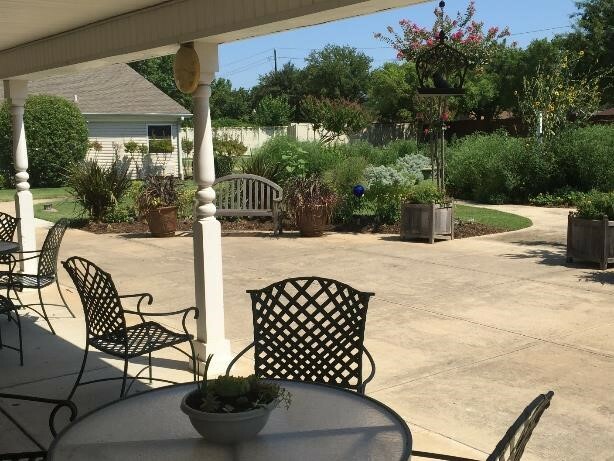 During National Horticultural Therapy Week this week, the staff, clients, and volunteers at Arden Courts of Richardson in Texas held a ceremony to honor the recent NWF wildlife habitat distinction of their gardens, which include raised beds, containers, and in-ground planting beds. This distinction was earned as the result of many people’s hard work, sweat, and plenty of dirt under our fingernails. 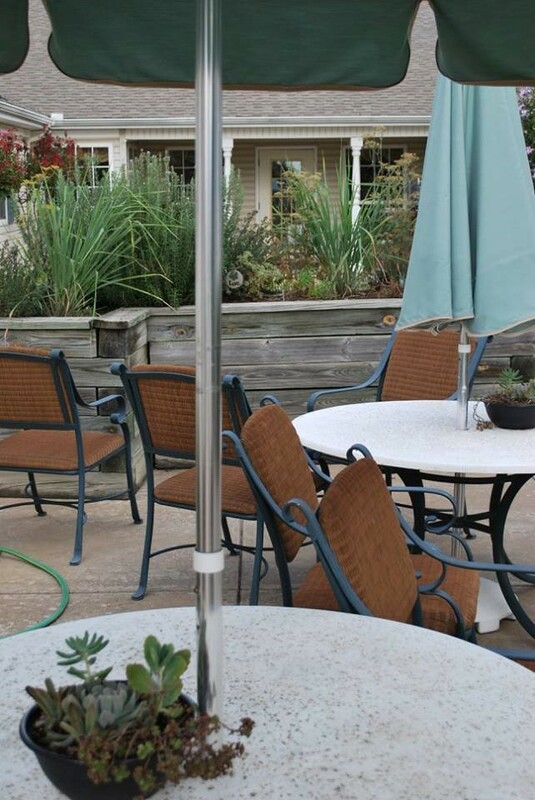 The gardens contain a variety of sensory stimulating herbs and other plants that are pollinator friendly and drought and heat tolerant, birdhouses, birdbaths, among other garden features. 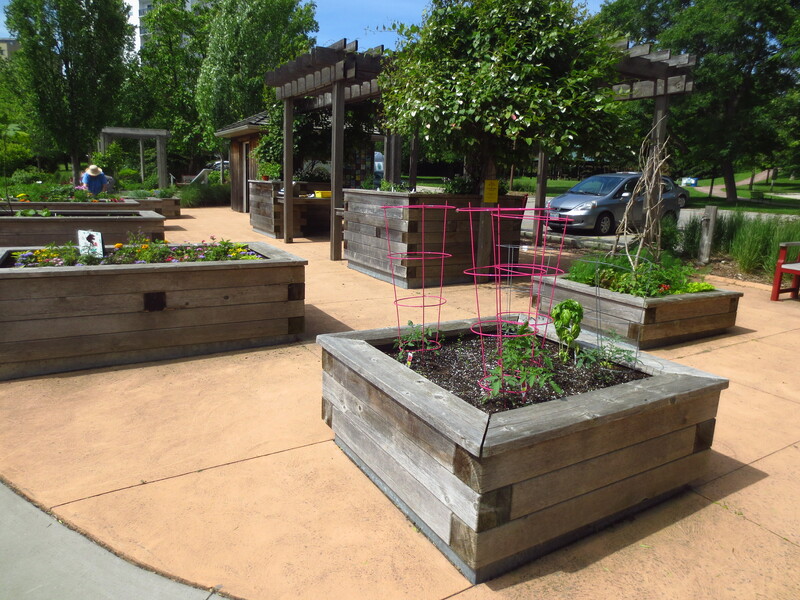 Check out some photos of our garden spaces. Enabling gardens originated as barrier-free space for people with physical disabilities. 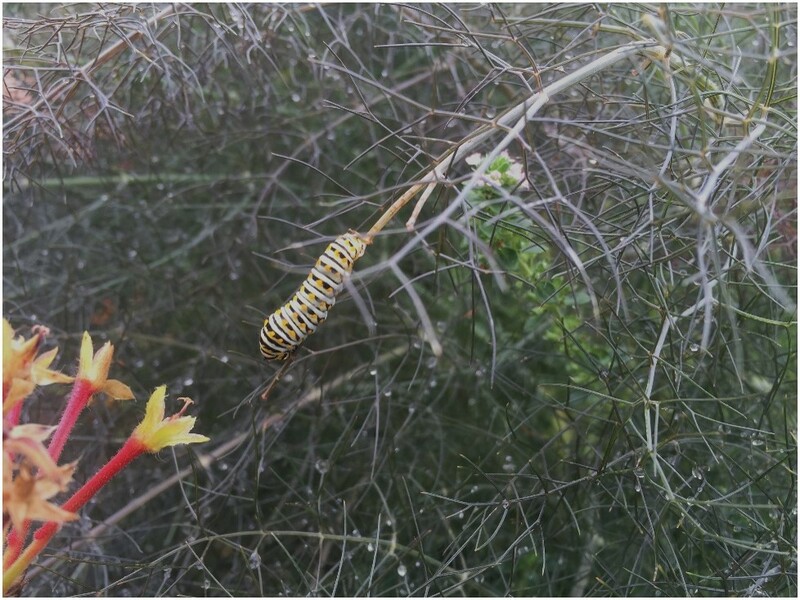 The more current understanding—one that is less restrictive and more inclusive—is one where all visitors are engaged in the garden through programming, garden features, and plant selection (Diehl, 2013; Cooper Marcus, 2014). Enabling people of all ages and abilities to garden with fewer barriers reflects the evolution of this type of healing garden. 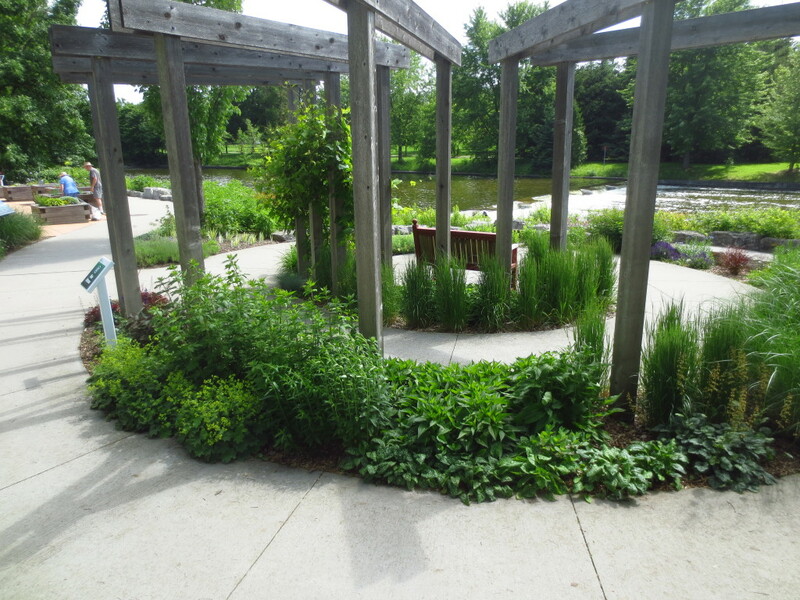 The Guelph Enabling Garden (GEG) is an excellent example of this newer trend. 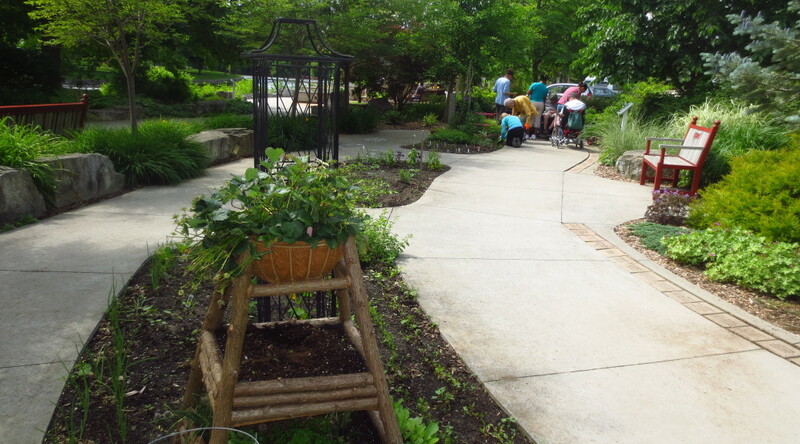 While hosting an educational forum in June 2015, with a program titled Horticultural Therapy Programs that Excite, Excel and Engage, the garden welcomed community members, horticultural therapy (HT) practitioners, and health service providers. 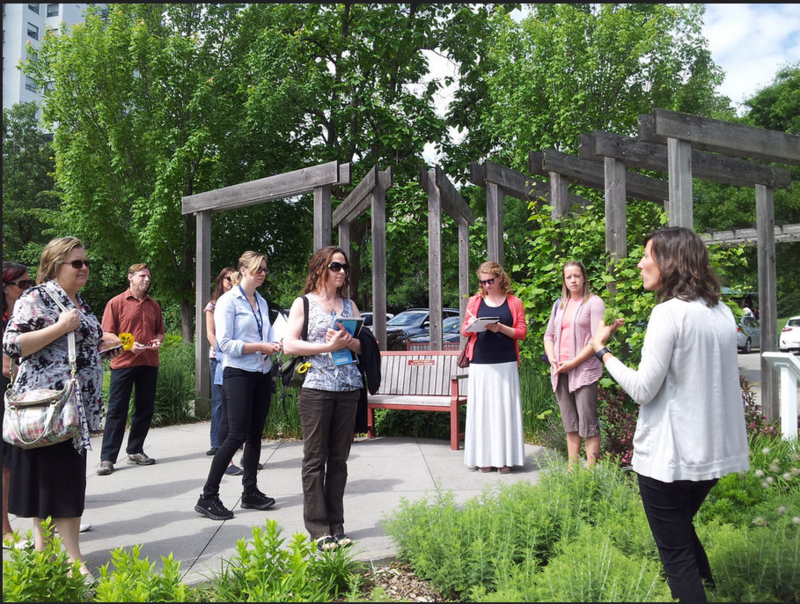 The workshop included an informational session on nature-based recreational and therapeutic programming targeted to improving health, as well as a tour of the enabling garden, led by GEG’s registered horticultural therapist Heidi Torreiter. Demonstrating how effective a therapeutic garden can be for activities and programming of all kinds, Torreiter and co-presenter Lesley Fleming, HTR, delivered three hands-on activities used in HT programming, including the making of small flower bouquets, an active game to increase physical activity, and a meditation session. Programs geared to a broad spectrum of groups and individuals are offered throughout the year at the garden. Horticultural therapy, along with recreational programs like Staying Well in the Winter, Soil Compost Water, and Sense Based Activity, appeal to wellness groups and people with visible and invisible health challenges. 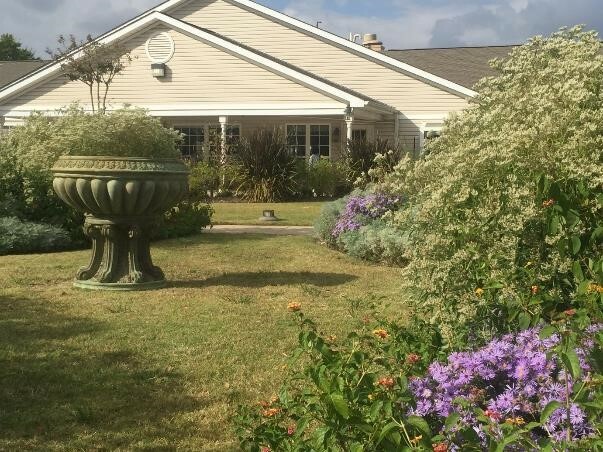 Delivered by professionally credentialed staff, the programs in this beautiful garden setting with its abundant natural materials contribute to the popularity of the programs. Set in a public park and adjacent to several senior citizen facilities, the physical location of the Guelph Enabling Garden further increases access, particularly for neighboring elders. 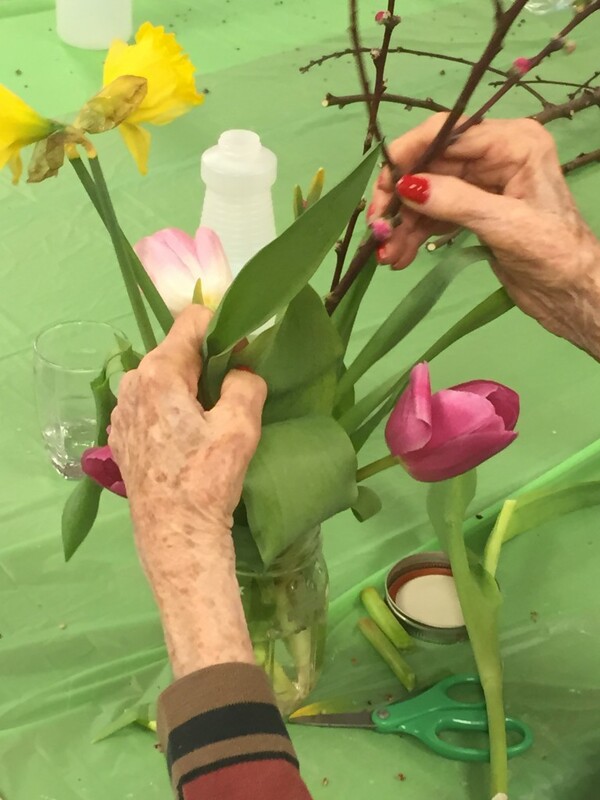 Collaborative relationships with organizations, including the seniors’ facilities, provide for designated planting areas, specific programmed activities, and a volunteer base from those who have participated in garden activities. The physical features of the Guelph Enabling Garden define it as one that reduces barriers to gardening. 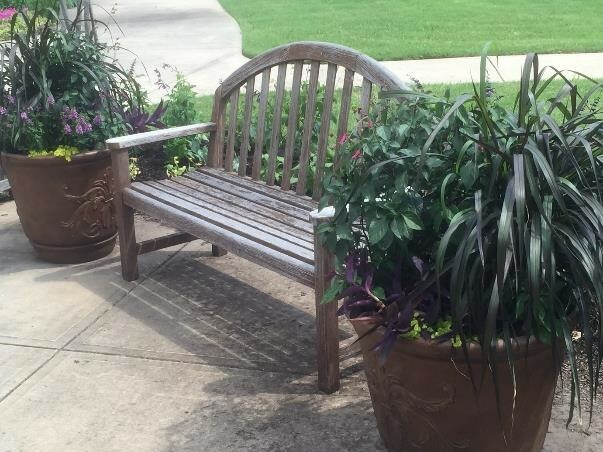 For home gardeners and program participants, raised beds at several different heights, hanging baskets, container gardens, wide and smooth paths, signage, and plant selection like lavender, spirea, and soft wormwort provide ideas for minimizing physical barriers. Designed as a circle that overlooks the nearby Speed River, the Spiral Garden offers a venue for special events. Small enough for intimate poetry readings and large enough for wedding vows, it has been used for gatherings and group activities of all kinds. The beauty of the garden set beside the river offers an added layer of nature within the city limits. Observing the visitors to the garden—children delighted by the fairy garden, people with mobility impairments moving effortlessly along accessible paths, seniors from next door digging in the dirt, a cyclist slowly pedaling past the mass floral display, a group of young adults with intellectual disabilities planting herbs with the horticultural therapist, tourists looking for zone 5 plant specimens to consider for their own gardens in Michigan or Nova Scotia—there is something for everyone at the Guelph Enabling Garden. It is where beauty and function merge for passive and active plant and human interactions. Diehl, L. (2013). A Framework for Categorizing Healing Gardens. American Horticultural Therapy Association News Magazine 41(2) 4-6.
Cooper Marcus, C. & Sachs, N. (2014). Therapeutic Landscapes: An Evidence-Based Approach to Designing Healing Gardens and Restorative Outdoor Spaces. 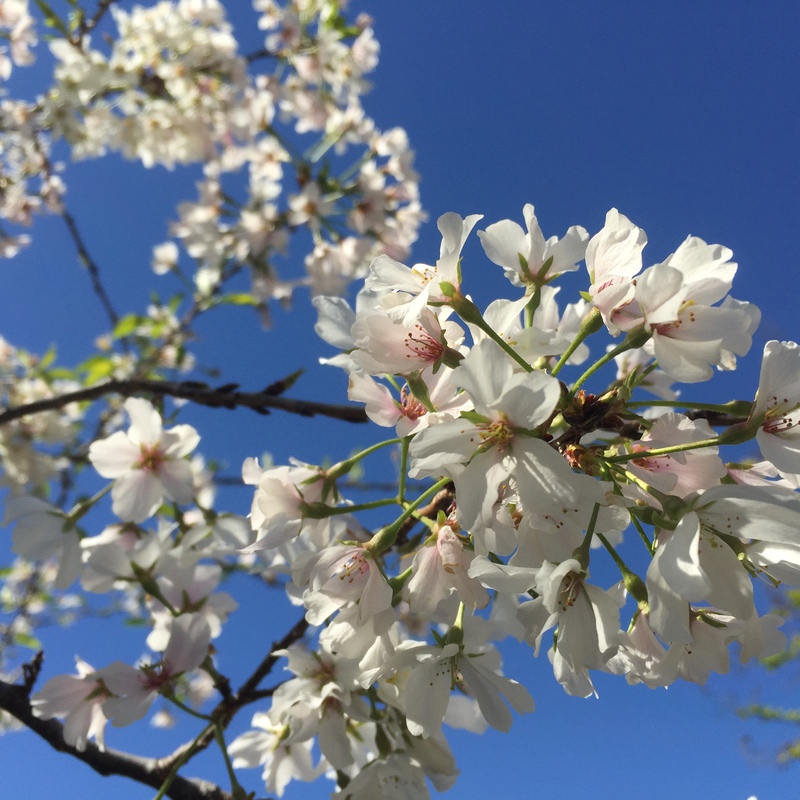 The Yoshino cherry trees are blooming here in North Texas – celebrating the start of spring right along with us. Now is the time to get outdoors and enjoy their beautiful white and blush pink floral displays. And quick – check them out before their striking beauty fades, or you’ll have to wait another year before they bloom again. 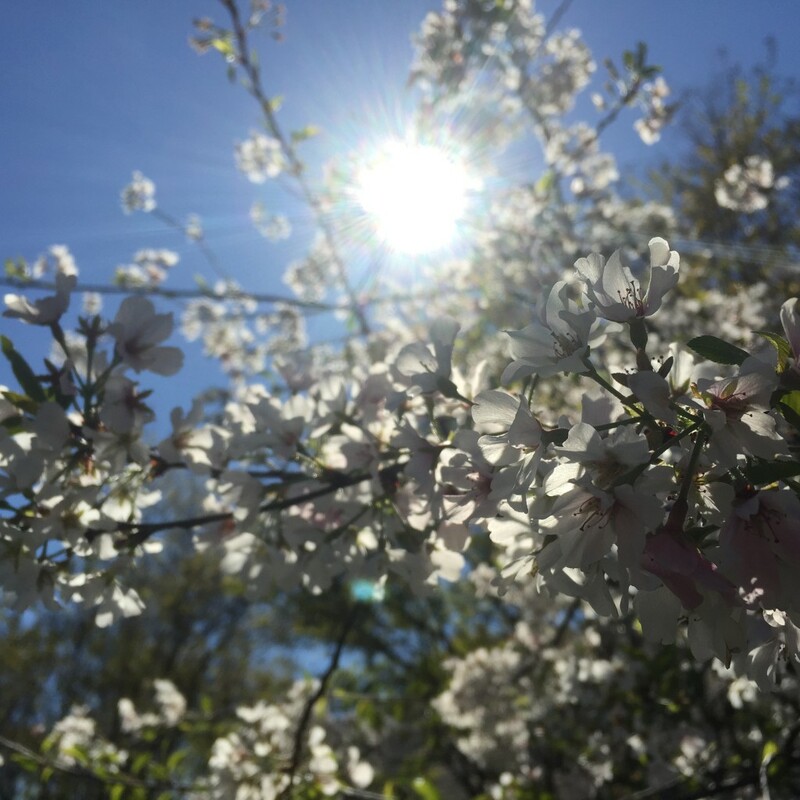 Horticultural therapy clients can derive personal meaning from this message about honoring the ephemeral yet beautiful nature of life through the metaphor of the cherry blossoms, especially through the example of Hanami. Though the cherries bloom for a short time, the Japanese people celebrate this time with their loved ones, enjoying quality time with one another. “Celebrating special moments, like cherry blossom time, can mark the cycle of life by using tangible plant material as a symbol for the annual passage of time or to evoke special, pleasant memories where the client recalls happy or poignant experiences and occasions,” wrote Margaret Shillingford, BS, MEd, and Lesley Fleming, MA, HTR, in their article “Cherry Blossoms, Symbolism and HT,” originally published in The American Horticultural Therapy Association News Magazine, volume 40, number 2. In working with clients, share photos of cherry blossoms and Hanami celebrations depicted in Asian art, day and night time celebrations of Hanami in Japan, and even the blooming Yoshino cherry trees around the Tidal Basin in Washington, D.C. (The 3,000-plus Washington trees were a gift from Japan to the United States, as a goodwill gesture, in the 1912, and celebrated during the Cherry Blossom Festival each spring. Read more about it here. You can even watch the cherry trees in bloom with the “Cherry Blossom Cam” in Washington here.) Pass around cherry branches and examine the buds and blossoms. Reminisce about favorite seasonal family gatherings and celebrations. 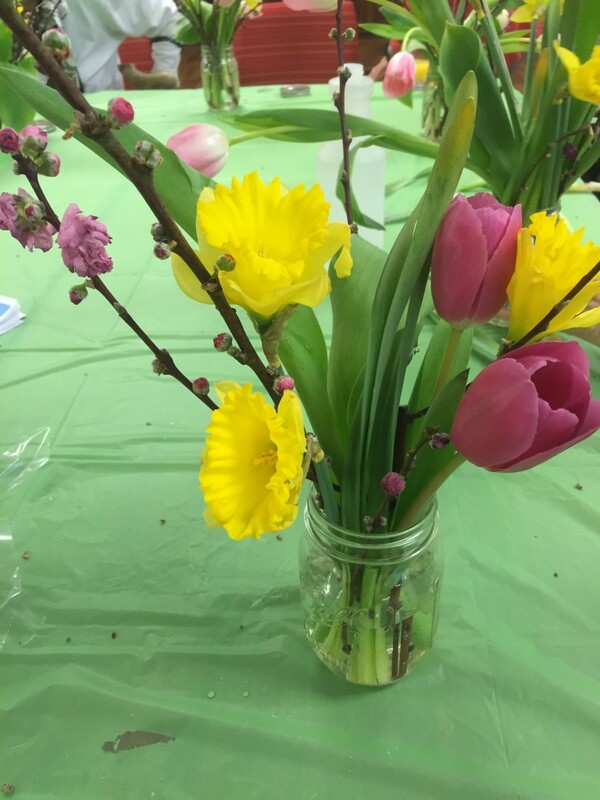 Create individual or group floral arrangements using cherry branches and other spring flowers. Celebrating National Horticultural Therapy Week! Happy First Day of Spring! We are celebrating National Horticultural Therapy Week during this first week of spring. 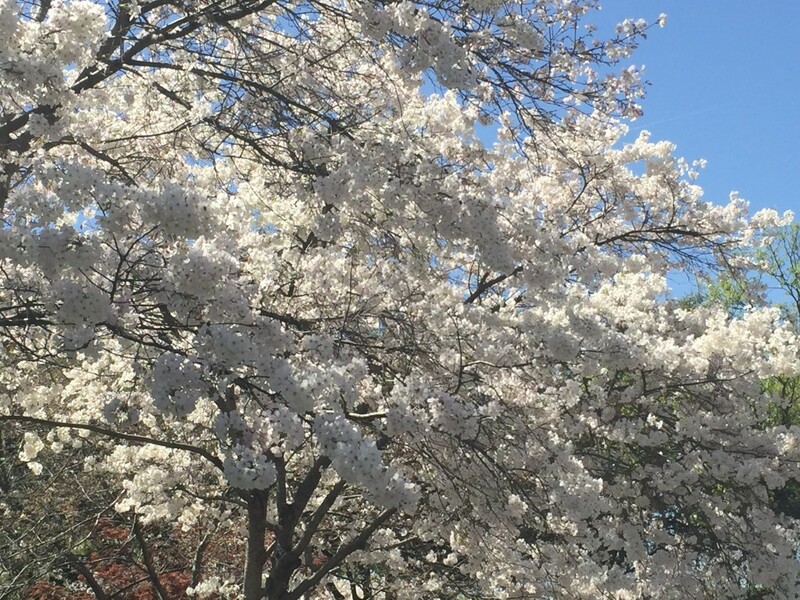 As we enjoy the ephemeral beauty of the new season, check back all this week for new posts in honor of the use of horticulture as a therapeutic modality. Learn more about the practice of horticultural therapy through the American Horticultural Therapy Association. 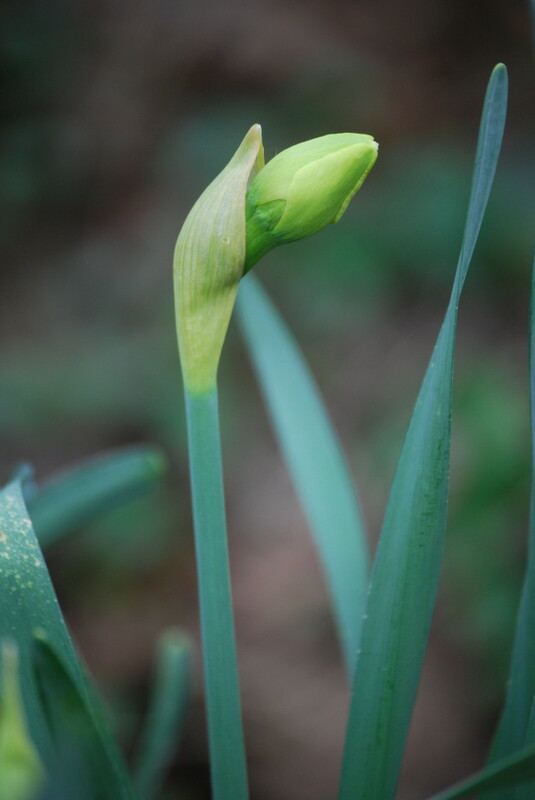 Bursting with new life, spring flowering bulbs herald in the season of renewal. Recognizing beauty in each stage of growth, florists maximize the versatility of bulbs and use them creatively in a variety of ways. Bare bulbs are architectural. Stacked as a mass or as a singular specimen, a bulb’s color, shape, and roots intrigue, particularly when presented in glass vessels. Bulbs can be purchased in soil or soil-less. Rinsing off the soil will offer the cleanest presentation and will not hinder sprouting. (Read more about bulbs here). For dramatic style, place bulbs at the base of a flower arrangement. Juxtaposing blossom with bulb, soft with hard, adds depth and layers of dimension. 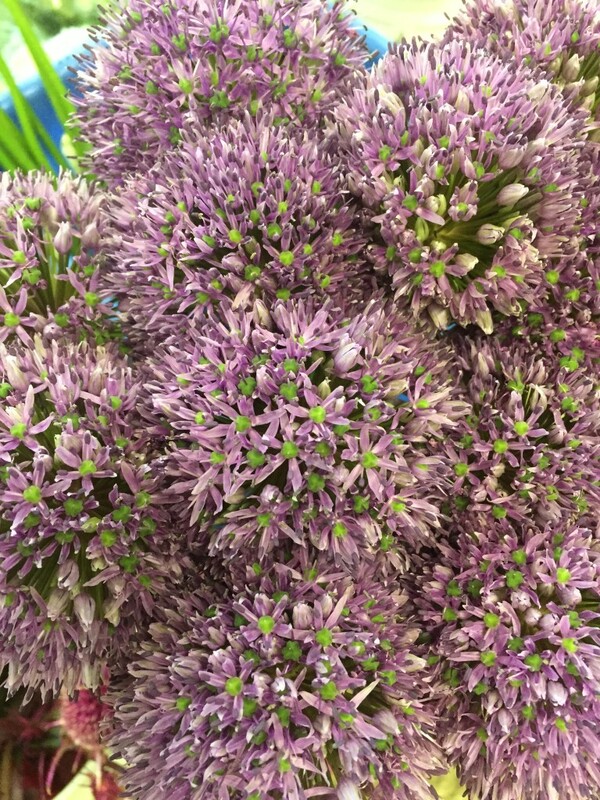 Blossoms from spring flowering bulbs — alliums, tulips, daffodils, muscari — are beautiful as cut flowers meticulously arranged or placed simply in a vase. The fragrance of lily of the valley, freesia, or hyacinths provide immediate pleasure and memories of springtimes past. The many lives of bulbs…once they’ve finished their show in vases, bulbs can be planted in the ground for another chance at nature’s cycle, in growing zones where hardy. The carbon footprint of a bulb’s journey can be positive and renewable. Note: Bulbs used at the base of an arrangement are less likely to be viable. 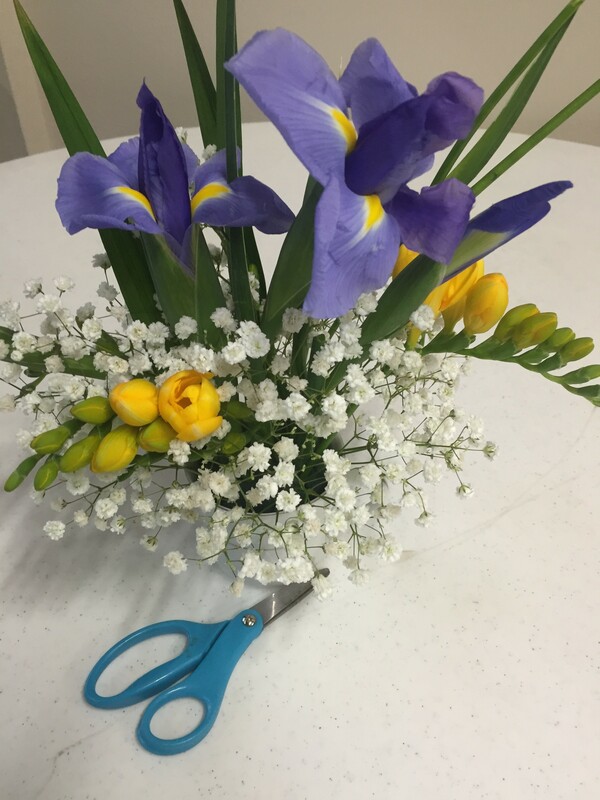 Client-made floral arrangement using freesia and California iris (alternative for Dutch iris). For your own spring awakening, try bulbs in any of these renditions. 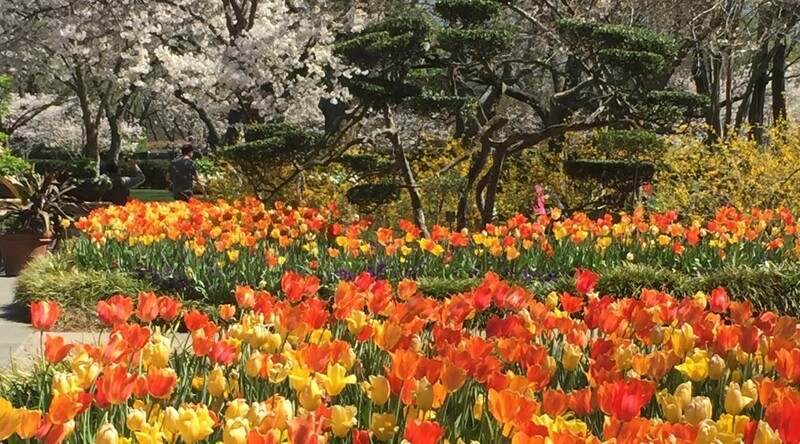 Or consider inspiration from international bulb showcases: Dallas Arboretum in Texas, Canadian Tulip Festival in Ottawa, Floralia Brussels at Chateau de Grand-Bigard in Belgium, or the Netherlands’ Keukenhof. Bulbs planted in fall produce spring flowers. Bulbs planted in spring bring summer blossoms. Authors Lesley Fleming and Sarah Bayat combine their talents for this series. Lesley is a registered horticultural therapist who uses cut flowers for therapeutic activities. Sarah is creative director of Floris Flowers Co. 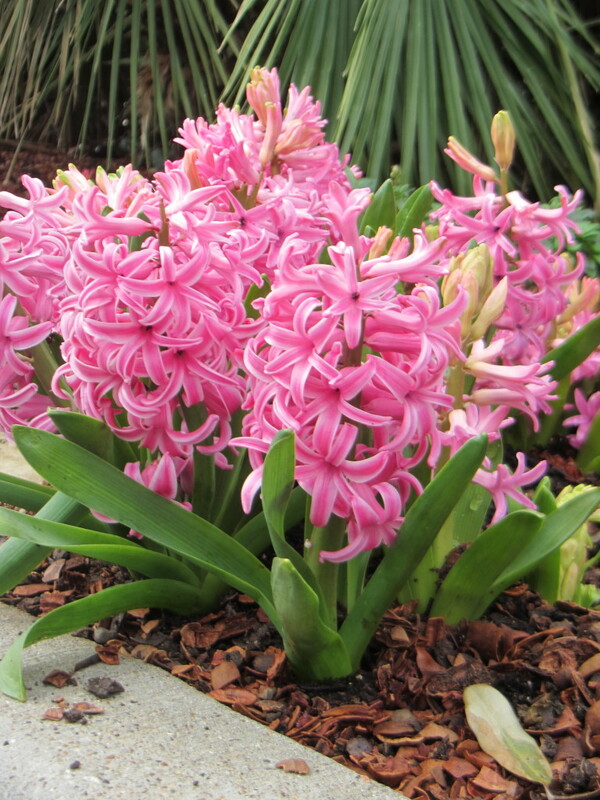 This is the third in a series of four articles sharing tips on spring bulbs. The fourth article will offer tips for floral arrangements. 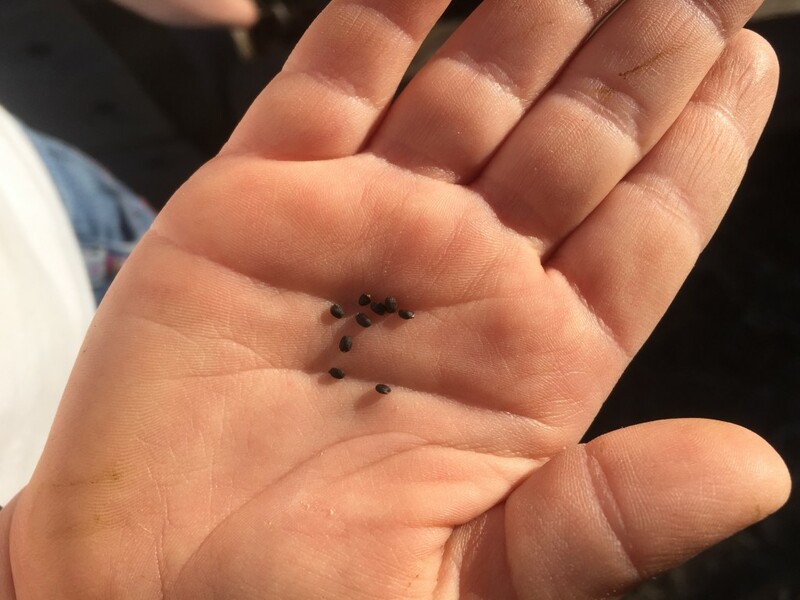 At a time when gardeners are sowing seeds in preparation for the spring garden, let’s talk about seeds…basil seed in particular. About a year ago, friend and fellow practitioner Charles Plummer of Youth with Faces told me about how basil seed can change before your very eyes, if you just add water. He had learned this from Rebecca Haller, HTM, during one of the Horticultural Therapy Institute’s courses. 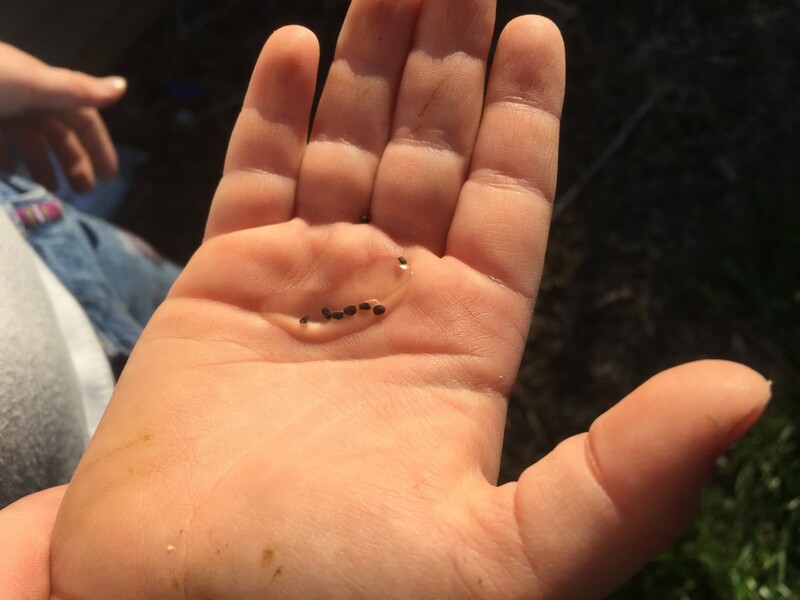 It took me a couple more months – when I was preparing to lead a seed sowing session with one of my groups – before I was in the same room as basil seed, an eye dropper, and some water. So in taking Charles’ advice, I gave it a try. Did you know that basil seed can change right before your eyes in just a few seconds? 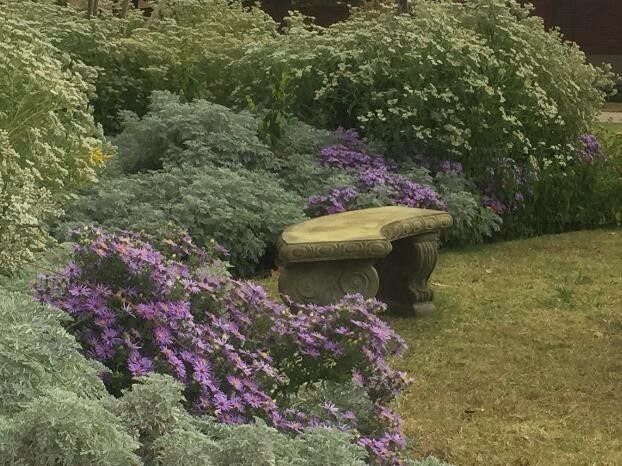 In a world of instant gratification, clients can sometimes get impatient with the “slow growing” nature of plants in the garden. 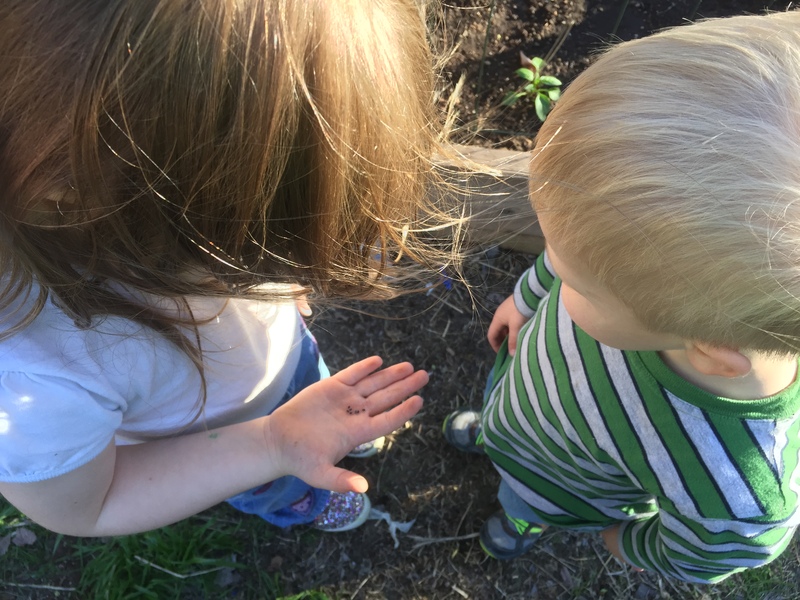 This is a great opportunity for a meaningful lesson, or actually a series of lessons, on the phrase “Good things come to those who wait.” The act of nurturing a plant – from seed to seedling to full grown plants that can be harvested for eating or collecting seed – can help the gardener experience the cyclical nature of life in real time. Some things just don’t happen overnight…patience is a virtue. So what exactly does the basil seed do when you add water? As Charles would say, just give it a try yourself. I’ll give you a sneak peek below. 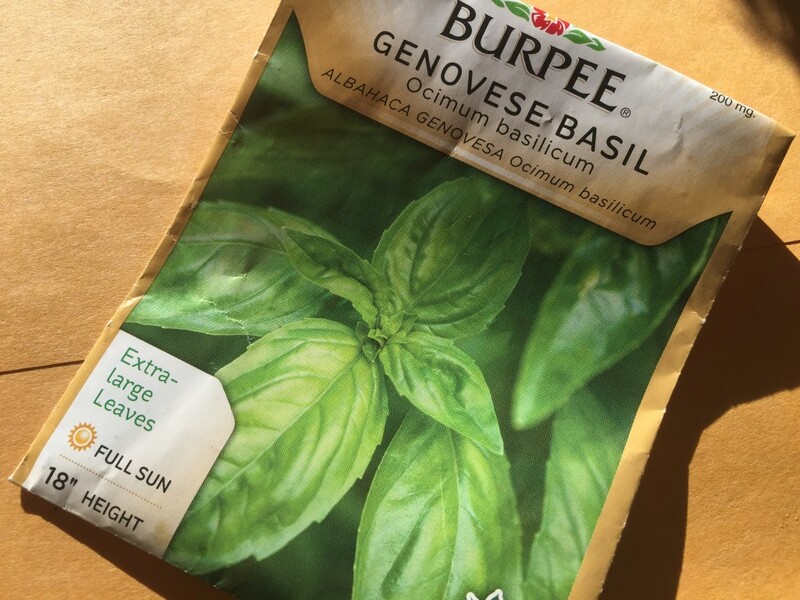 To start, gather together the following materials: basil seed (I used the Genovese type because it was handy, though I’m sure pretty much any basil seed would work), cup of water, eye dropper, and your hands. Open your hand out flat so that the palm of your hand is facing up toward the sky. 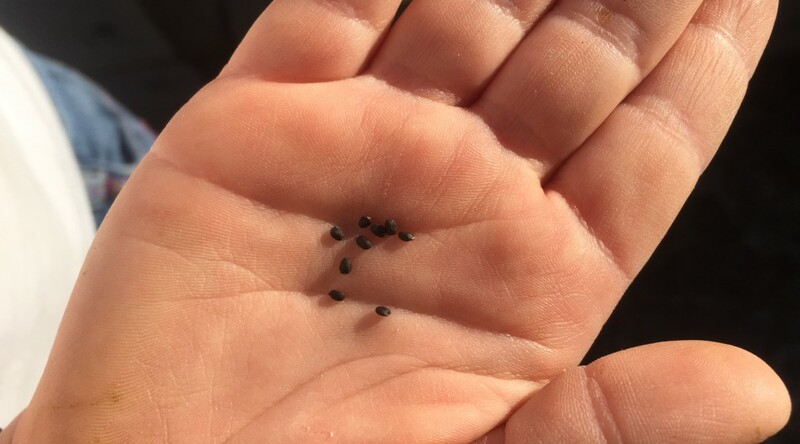 Gently tap some basil seed out of the seed packet into the palm of your hand. Take note of what the basil looks and feels like at this time. 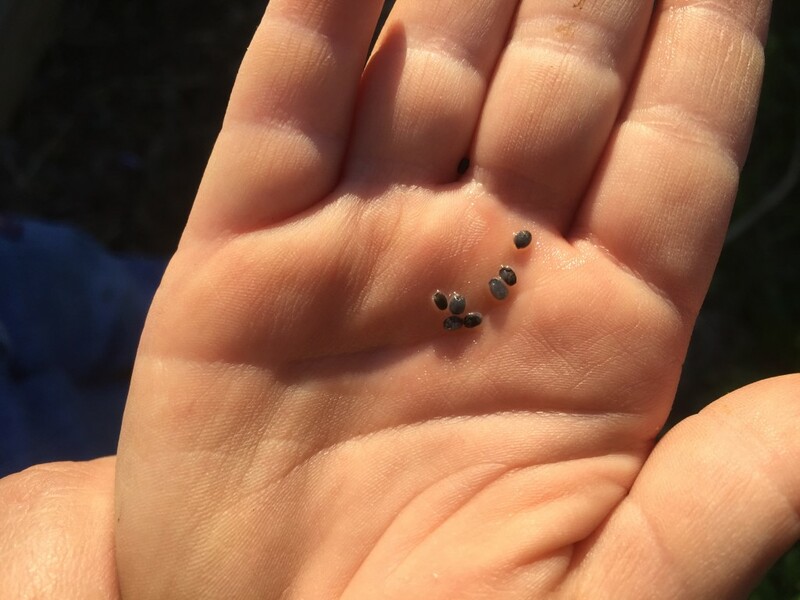 The seed is tiny in size and black in color – it kinda looks like the poppy seeds that get stuck in your teeth after eating a poppy seed bagel. Use a finger from your other hand to roll the dry seed around in your hand. Focus your attention on the sensation of the seed rolling around in your hand. Next, get some water in your eye dropper and add a few drops of water over the top of the seed. Make sure the seed has contact with the water. Notice how the added water feels to your skin – cool and wet. And watch. Focus all of your attention on the seed. Be patient and watch. It doesn’t happen instantly. And, don’t worry, the seeds aren’t jumping beans, so they won’t start popping up into your face. They also don’t grow spikes or turn into orange and blue polka dots. There! Do you see it?!? What happened? The basil started turning a different color. What color? It’s kind of a gray color, right? After a few seconds – at least 30 seconds, probably more – the basil seed will soak up most, if not all, of the water. The seed will have changed from tiny, black seeds to slightly larger, puffier, whitish gray seeds. If you look very closely, you can actually see the layer of seed mucilage over the seed coat. 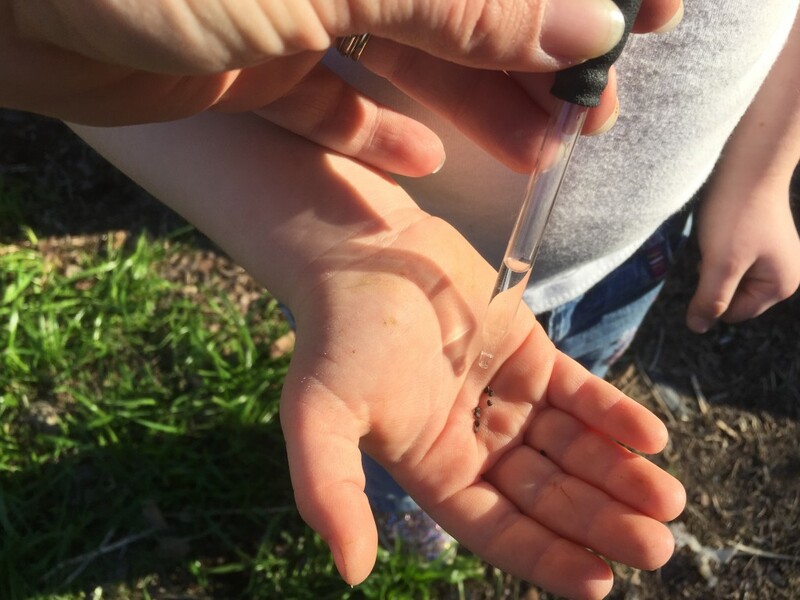 After I first did this activity, I felt exhilarated and inspired to learn more about why these seeds do this – and every time I have done this activity since then, I’ve felt the same way. There is always a point – typically right when the water is added to the seeds – at which I think to myself, “Will the seeds change?” And then it happens.